It’s the “movie” that everyone’s talking about — and it hasn’t even been made yet. “What if a people that share a common and rich heritage can find a common future. Their story is well known. But what will be their sequel?” the narrator asks as scenes from North Korea fill the screen. 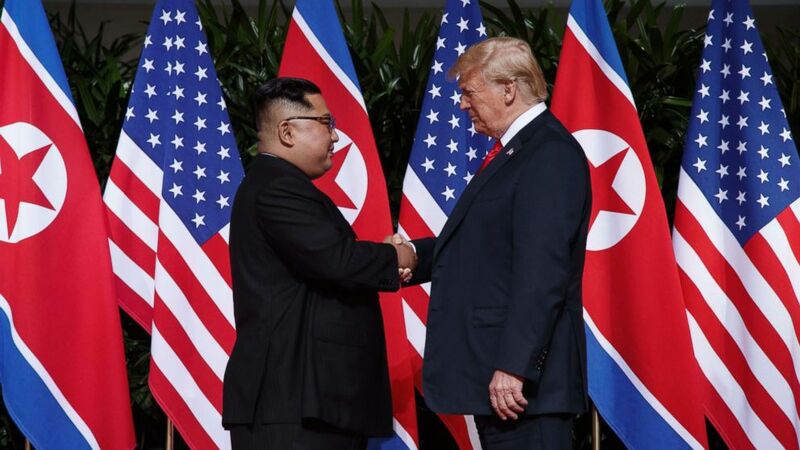 “Featuring President Donald Trump and Chairman Kim Jong Un in a meeting to remake history, to shine in the sun. One moment. One choice. What if? The future remains to be written,” the narrator continues. “Will he shake the hand of peace?” the narrator asks. “It is maybe the most propagandistic four minutes that I have ever seen,” Travers added. “Who made this? Destiny Pictures? Did Trump hire them to make the movie? I think that’s yet to be decided, but what we’re seeing on screen is nothing but people saying, ‘Look, let’s cheer. Let’s propagandize,'” said Travers. “We had it made up. I showed it to him today, actually during the meeting, toward the end of the meeting and I think he loved it,” Trump said of the video during a news conference. The video was also shown to a wider audience at the start of Tuesday’s press conference before making the rounds on social media. “It’s the scariest four minutes I’ve seen on screen this year,” he said. Watch Peter Travers’ review of the movie trailer in the video above.